I love the example renowned fitness expert, Alwyn Cosgrove gave. He asked, “if your best friend was the #1 plastic surgeon in London, you’d probably be impressed. If they were the #1 lawyer in New York, you’d probably be like “wow!”. What would most people outside of fitness attitude be if your buddy was the #1 personal trainer in Orlando?” Of course what Alwyn is talking about has nothing to do with Orlando being a bad place, but more so the fact that fitness as industry hasn’t done itself any favors in building a stellar reputation. Yet, all the time we see people on social media asking, “when will fitness professionals get the respect of doctors, physical therapists, and lawyers?” Seriously guys? Seriously?! 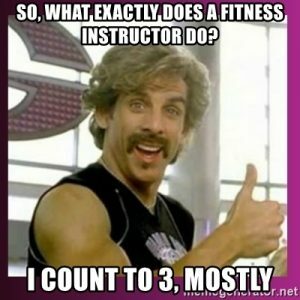 It is my mission to be a part of changing how not others see fitness professionals, but the standards that fitness professionals shoot for themselves. Getting out of the mindset that our job is to make people sweat, count reps, things that my 14 year old nephew could probably do easy, is really important! How do we this? I believe it starts with thinking of ourselves of teachers of movement. Being a teacher means our job is to help educate people on how to use their bodies smarter and more effectively. In order to accomplish such a lofty goal WE have to understand how the body works first! Alwyn and I were talking this past weekend and he told me how when he posted this DVRT exercise someone told him it was “too functional”. We would love to laugh at asking, “what does that even mean?”! However, we know what it means. It means that it looks too complicated, it is too confusing on what is going on, it means people don’t actually understand how the body functions. As I wrote about last week (you can read HERE), functional training has nothing to do with replicating real life activity, but rather focuses on the building the concepts of human movement. I tell coaches all the time, we can’t fix something though we don’t even understand. A great example is this drill that DVRT Master, Cory Cripe, is using with his client that is recovering from post-hip replacement. Why would this drill be a part of a hip replacement recovery program? What does THIS have to do with the hip? If we don’t understand why then we are missing the bigger picture. The hips and shoulders rely heavily on two things. That is the core functioning correctly and the core working by how we use our hands and feet. Our hands and feet are the entry point for everything to happen in our body, including HOW we use our core correctly. With over half of our bones in our hands and feet, you may not be surprised to hear me say they are pretty important to teach people HOW to use! Our body is also a series of connected chains, not individual muscles. Knowing the chains of the body allows us to create exercises and more importantly solutions that help us get better faster than we ever imagined possible. One of the most important chains is the connection of the lats, core, and glutes. This chain plays a large role in how we stabilize our spine during the unstable motions of running and walking. By pulling apart the Ultimate Sandbag we engage the hands, shoulders, lats, and core. Pressing out the Ultimate Sandbag creates the brace that helps stabilize our spine and engages the connection to the hip. As Cory told me though, they started in the standing position, worked through military and sprinter stance, and because he was nailing the motion, he took it to the ground. Why the ground? In a tall kneeling position we can challenge his core, hip, and chains by making it more difficult to use his feet. Teaching him to push into the ground with the balls of his feet allows his glutes to light up, but sometimes we need a bit more help. However, Cory told me that when they went down to the ground and even though he gave the client all the right cues, his low back started to bother him. Cory being a bright coach didn’t ditch the exercise. He realized that the client simply required more feedback. One of the best tools to offer clients feedback are bands. Cuing his client to push through the balls of his feet and keep tension into the band allowed the client to solve the low back issue while really getting the connection of the chains. Of course the best part is the results he is getting, progressing faster than doctors could ever imagine. Stories like this one combined with what I shared earlier in the week with the woman who could squat the first time in years without pain (you can read HERE) are the ways that our industry can be looked upon differently. We can be seen as “health professionals”, not sweat devils. However, it has to be a choice the coach makes and we have to want, no, DEMAND our industry work on a higher level! Cory has helped several people overcome some pretty amazing issues. The key is how can we bring exercise back to meet the person where they are at. This hip bridge is a great example.